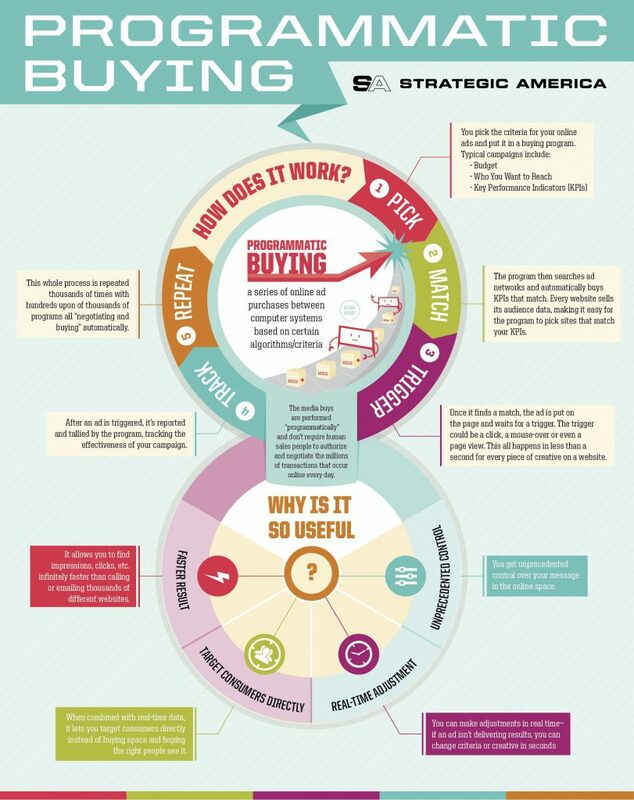 Programmatic is a more focused way of purchasing online display. Instead of doing manual work on establishing which websites are relevant to reach your target audience and buying separately from each website or a selection through a display network. You can use one single provider and rather then buying banner space on websites you can buy a target audience i.e people. This technology is cookie based. Which means that when you surf the web information from your ISP (such as geography and age) together with your previous browser history (determine your interests as well as sites you visit frequently) creates a user profile. This is the profile hat you can then target. The mechanics behind programmatic works similar to an auction. Large websites have ad placements that are unused, then they (that said it does not necessary have to be the crappy placements) they put the placements up for auction. The programmatic trading desks then put in a bid for the ad placement, in lieu with the targeting information to show your ad there but only to the people you wish to target. This technology is in my opinion a win-win. When you buy ad space on a large website you buy banner views to everyone and anyone. If you want to maximize the use of your media budget and reach only people who are relevant to you then programmatic is the way to go. You pay for more effective and relevant advertising then buying in bulk from a website or network – where you buy to be exposed to anyone. During the campaign period the programmatic campaign is also optimized just as “old-fashioned” banner campaigns. But using programmatic you refine the campaign performance and can drive and deliver higher value from this type of campaign. When you don’t want to get your media budget locked into a contract or for a specific period or to a network. Be in more control of who and where your ads get shown. Ensure that you buy in the top 10% of the best ad placements on a website.